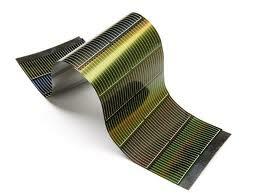 Solar panels today are primarily made from silicon. Some solar panel sceptics have pointed out that solar panels require large inputs of energy from fossil fuels in the manufacturing process with most of the production powered by oil, gas and diesel not solar panels. Although over their lifetime Solar panels produce far more energy than was used to produce them it is still wise to look at ways to reduce this carbon cost. Researchers are now looking into producing solar panels by an organic process that prints them onto plastic film. They would generate energy in a way similar to plant photosynthesis. These organic photovoltaics (OPV’s) use low cost and environmentally friendly production methods to produce solar panels. Light weight and flexible materials will also allow a distinct change in how and where energy can be produced. It would be much easier to apply flexible strips of solar panels to the outside of a building than the current type of rigid solar panels. The researchers from Australia have recently had some success in printing solar panels “We’re using the same techniques that you would use if you were screen printing an image on to a T-Shirt,” says Dr David Jones, one of the researchers. Using semiconducting inks, they print the cells straight onto paper-thin flexible plastic or steel. With the ability to print at speeds of up to ten metres per minute, this means they can produce one cell every two seconds. There are huge possibilities for such cells and solar panels, commercial applications are still a bit away but the technology is making quick progress.